Ben Hoare Bell is a well-established and expanding solicitors firm with branches in the North East of England in Newcastle, Sunderland, Southwick and Gateshead. They are an award winning solicitors and pride themselves on the quality of the specialist staff and advice they can offer. They are committed to providing a service to both publicly funded clients and private clients. 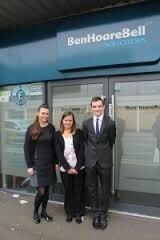 The staff at Ben Hoare Bell is friendly and approachable. With many years of expereince they ensure the best possible legal help that specific circumstances require also catering to the clients requirements.